Tonight (Wednesday, September 10, 2014) President Obama will deliver a rare primetime television address to the Nation. 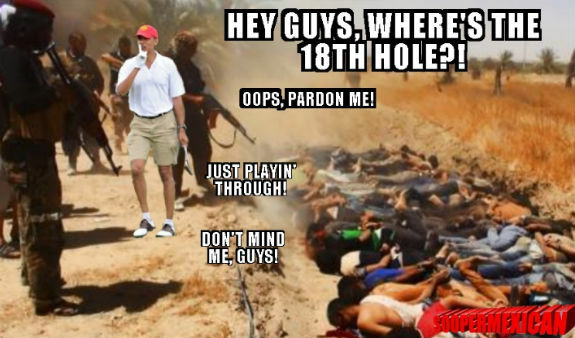 The announced purpose is for Obama to spell out his plan to combat “militants” from the Islamic State. These would be the same “militants” toward whom Obama said during an August 29 White House press briefing “We don’t have a strategy yet” to bipartisan, indeed, almost universal condemnation. And the lack of a “reasonable degree of foresight” and “basic hindsight” are what has been lacking in our strategy to defeat militant Islam since its latest iteration came on the world stage in the late 1980s. As Iraq and Syria have spiraled into a Sunni verses Shiite Muslim religious war political correctness run amuck has blinded the western news media and the policy makers in the Obama administration to the fact that there are no “good guys” in this Muslim on Muslim war. The blood thirsty ISIS political movement that is fighting to establish a new radical Islamist “Caliphate” in Syria, Iraq and beyond is Sunni in origin. The Islamic State has already established a radical form of Islamist government based on Sharia law in the territory it controls and begun the persecution of Christians. Would we really be more “secure” with governments modeled on Iran installed in Syria and Iraq? In areas of Iraq that Muqtada al-Sadr’s Mahadi Army once controlled, such as Najaf and Diwaniya, opponents were assassinated and Sharia courts were established. The Sharia courts were run by judges sent from the Shite religious capital of Najaf and punishments such as 80 lashes for stealing and drinking alcohol were carried out by court police. Dancing was prohibited as was singing and even reciting nursery rhymes. Unless American policy makers recognize and tell the American people that this is not just a war against various terrorist movements that seek to control governments, but a war of ideas between radical Islam and the western ideals of tolerance and freedom of thought, speech and religion the battles occurring in Iraq today will be refought in our own streets tomorrow. The "defense gap" that Republicans held over Democrats for years has reemerged as significant factor in the fast approaching 2014 elections. The problem that Obama will address tonight is his political problem going into the midterm elections, not the political, military and cultural problem presented by ISIS and the rise of the Islamic State. Obama is never going to say that because it completely turns on its head the foreign policy he announced at the beginning of his presidency and the whole myth of Islam as a “religion of peace” that the Washington foreign policy and national security establishments have been feeding Americans for over 25 years. Until the United States has a President who is prepared to exercise "basic hindsight" and addresses the political, military and cultural battles radical Islam presents, any strategy is bound to fail. Submitted by mikey on Wed, 09/10/2014 - 15:31. Not many people are talking about this, but it's a big deal. Have you been noticing that the lugnuts in this administration are calling this gang of terrorists ISIL instead of ISIS? ISIL is used intentionally, and in a subtle way, to say in effect, that they to not recognize the legitimacy of Israel. The Mainstream media is downplaying it, saying only that this regime does not like the association of Syria (the last letter in ISIS), with their failed policy in Syria. So they use the ISIL acronym instead, with the L standing for Levant. Then the mainstream have-truths the meaning of Levant, saying it only includes Syria and Lebanon. But in reality, Levant includes all the lands along the eastern Mediterranean coast, which includes most of Israel. This is code for the Islamists, stating that this regime is on their side. And it's being swept under the rug by the corrupt propagandist media we have.